The 2019 Volvo V90 includes specialized electronic steering systems in its design. Unlike most steering systems, the proprietary Volvo technology provides drivers with the convenience of electronic steering personalization. This system can sense driving conditions and also allows drivers to choose between several steering sensitivity levels. These include high assistance, medium assistance, or even low assistance for higher-speed operations. The 2019 Volvo V90 makes it easy for drivers to change gears. Now, vehicle operators who wish to access the power of manual steering can use the steering mounted paddle shifters to change gears. Not only does this system make gear changes faster, but it also allows drivers to keep their hands on the wheels at all times. The 2019 V90 has plenty of power under the hood and it also includes special extended range transmissions to handle this power. 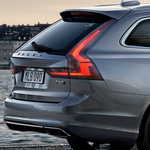 The V90 equips drivers with the proprietary Geartronic eight-speed automatic transmission system. This system automatically selects the right gear for driving conditions, and the extra ranges provide for more torque at the low end and higher speeds at the top-end.